This luxury gated community includes 427 Calabasas Real Estate Properties, including those in Stokes Canyon and Saddle Peak Estates. The homes found in this community range from 1800 to over 7,000 square feet in size, and feature several views including rolling canyons, sparkling city lights, and the stunning golf course. Residents in this community will also be granted with some exclusive privileges thanks to the Calabasas Park Homeowners Association. These privileges include membership and use of the top-notch Calabasas Swim and Tennis Center, and also the expansive Calabasas Lake. Enjoy a walk or jog along the Calabasas Lake which is featured with over 2 miles of path along the shore. These amenities along with fantastic schools, city programs, access to local parks, beaches and nature make a wonderful combination. 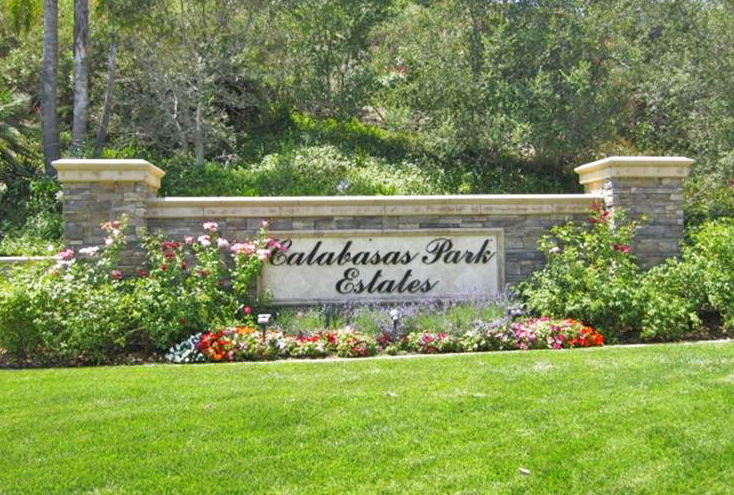 Living in Park Estates within the city of Calabasas is a fantastic way of life. If you’re interested in exploring the Calabasas Park Estates currently available to you or would like to schedule a consultation regarding your needs, please do not hesitate to contact our team today. We look forward to hearing from you and to helping you find the Calabasas Park Estates that not only meet your needs, but that also exceed your expectations. Connect today! The colorful landscape presented at the front entrance of the Calabasas Park Estates.